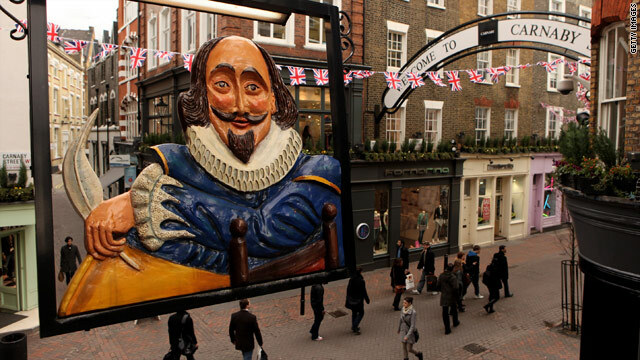 William Shakespeare as depicted on the sign outside Shakespeare's Head pub in London's iconic Carnaby Street. Five-act play described as a "romantic tragicomedy" with plot from Cervantes' "Don Quixote"
London, England (CNN) -- Shakespearean experts have deemed a play dismissed as an elaborate theatrical hoax by 18th century critics to be the true, albeit heavily diluted, work of the Bard. "Double Falsehood" was first published in 1727 by Lewis Theobald who said it was based on Shakespeare's missing play, "The History of Cardenio," of which Theobald claimed he had found not one but three copies. Critics dismissed the play as a fake and Theobald as a forger whose reputation was pummelled further by his nemesis Alexander Pope in the 17th century satirical poem, "The Dunciad." "Pope's poem 'The Dunciad' had a series of comical footnotes poking a deal of fun at the claim that Theobald made," said Brean Hammond, professor of Modern English Literature at Nottingham University. Pope's depiction of Theobald as the King of Dunces inspired Hammond to read "Double Falsehood" and unlike early experts he found some credibility in Theobald's claims. See how her beauty doth enrich the place! O, add the music of thy charming tongue. And make me think it paradise indeed. And chide thy coldness, love. "When I did read it I thought there is certainly 17th century material in it. It's not a straightforward literary forgery as I think people have been tempted to argue," Hammond said. That was 10 years ago. This week, British publishers Arden Shakespeare published the play for the first time in 250 years with evidence Hammond has gathered over the past decade that shows Shakespeare's hand in the work, which was co-written by John Fletcher. "There isn't one killer clue because it's quite a complicated textual situation. You've got a sort of geological map here, with different layers of time," Hammond said. "There are speeches, particularly in Act 1 but also in Act 2 and in the first couple of scenes of Act 3, where I think you can hear Shakespeare's voice, but I think there's very little in the second half. Fletcher it seems to me takes over the writing, and he was very much a man for plot and it becomes a ripping good yarn, as it were." The senior general editor of Arden Shakespeare's third series, Richard Proudfoot, describes the inclusion of "Double Falsehood" as the editors' "most controversial decision." "Enough good scholars over the past century have backed the presence of the Shakespeare in some measure in the play to give me the confidence to reach the decision that we should include it in the series," said Proudfoot, Professor Emeritus of King's College London, who is regarded as one of the world's leading Shakespearean experts. "If he (Theobald) forged the play, the real puzzle is why on earth did he leave in the forged play significant linguistic evidence for scholars today to be more confident, and more quickly confident, that there's Fletcher's writing in the play and Shakespeare?" Proudfoot said. The five-act play is described as a "romantic tragicomedy" which dramatizes the story of "Cardenio," as told in the first part of Miguel de Cervantes' "Don Quixote." "Set in Andalucia, the action shows the notorious libertine Henriquez ravishing the virtuous Violante and at the same time attempting to marry Leonora, the fiancée of his friend Julio," reads the description released by Arden Shakespeare. "Shakespeare meets Cervantes in the pages of the play, and that to me is one of the nicest things about it," said Hammond. The work of the Spanish author, poet and playwright Cervantes was first translated into English in 1612, and Shakespeare's latest writing was done in 1613, so "Cardenio" is believed to be the only play to combine their considerable talents. Records of payments show "Cardenio" was performed twice by The King's Men in 1613, and its name showed up on a list of manuscripts yet to be published with the names of the authors: Shakespeare and Fletcher. It is believed to have been adapted further in the 1600s before Theobald worked it into "Double Falsehood." The original manuscripts remain missing. Hammond believes that some, if not all, were destroyed in a theater fire in Covent Garden, London in 1809. "I think people should still stay out there looking. If they find them they can get their villa in Marbella," he laughed. The Royal Shakespeare Company said it is "very excited" about the discovery of the Bard's hand in "Double Falsehood." The Company plans to perform the play in Shakespeare's birthplace, Stratford-upon-Avon, at a date to be announced in 2011.